In my second post, I shared how Sarah worked with me and Karen to implement concept-based research as well as question-driven inquiry. Now we’ll shift to discuss how students conduct research in the Gather phase. I just finished my 4th year working as a school library media specialist, and I was a high school English teacher for 8 years before that. So I have a general idea of how a typical student at my school searches for sources: Google (most likely typing in an entire sentence or question), or at best a cursory glance at a database assigned by a teacher. We are continually striving to make the research phase more meaningful in order to support lifelong learning skills. Librarians crave more time with students in order to introduce them to all the databases available to them. And then databases function differently, requiring time for students to search within them and learn how to find the information they need. This past February, I read “Doubling Up: authentic vocabulary development through the inquiry process” by Leslie Maniotes and Anita Cellucci published in the February 2017 issue of Teacher Librarian. (A new fiscal year is starting soon; be sure to get your subscription to Teacher Librarian!) When I saw this article and read the first paragraph, one word came to mind: genius! I knew I wanted to implement the keyword log introduced in the article because it just made sense, like the GID model. And I found just the teacher willing to collaborate with me on this project. Jena Smith teaches the Public Speaking elective at my school, and she is a strong supporter of using library resources with her students. We collaborate frequently throughout the semester. Her students came to the library after selecting topics for their researched argumentative speeches. She created a Google Doc for students to record their topics. Sharing it with me helped me prepare mini-lessons targeted toward their chosen topics. 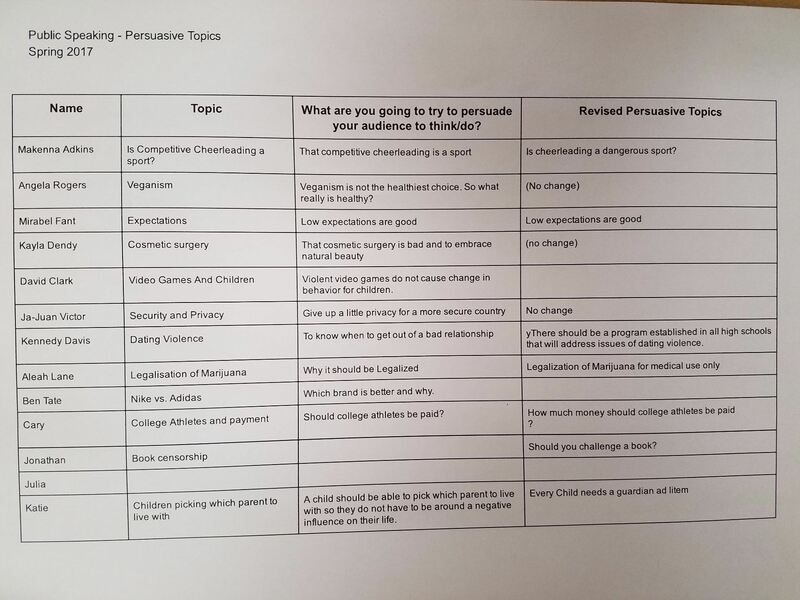 It also taught the students to revise their topics as they began to do research, as some realized their topics weren’t going to work or weren’t quite argumentative in nature. The rationale for using the keyword log, as presented by Maniotes and Cellucci, is to promote academic vocabulary growth as well as knowledge of information searching strategies. Even if students know what a Boolean operator is, they need to have some knowledge of the vocabulary specific to their topic. Luckily, unlike Google, databases provide keyword searches that will give students suggestions. 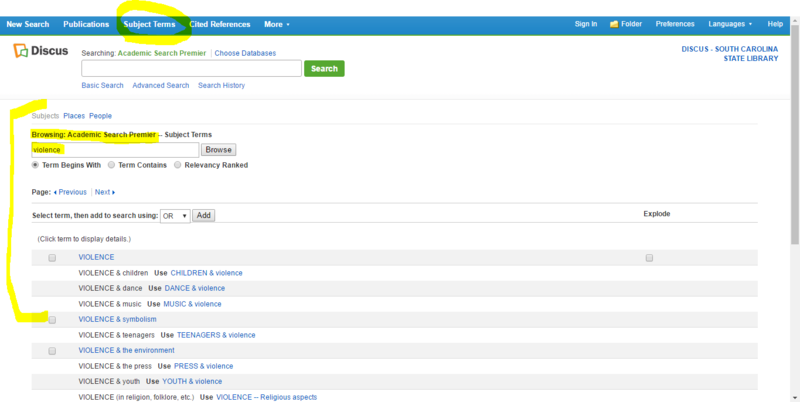 In EBSCO products, you can search in Subject Terms at the top of the page to learn synonyms. I mentioned ProQuest’s SIRS Issues Researcher database in my second blog post. It’s super easy to search related subject terms for vocabulary development. 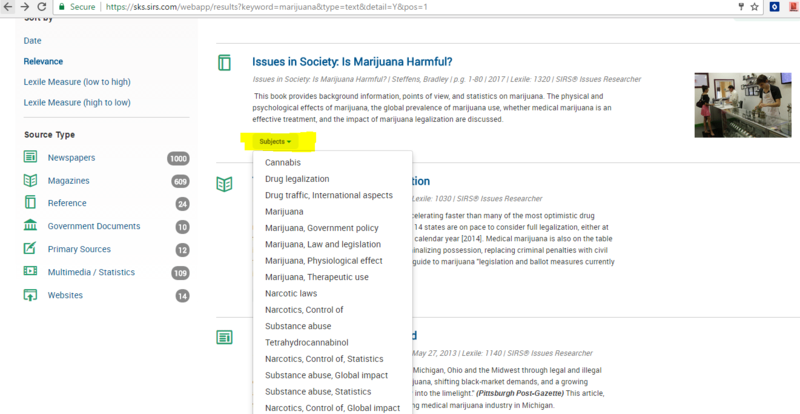 The subject terms are listed at the end of each article, which students can click on. 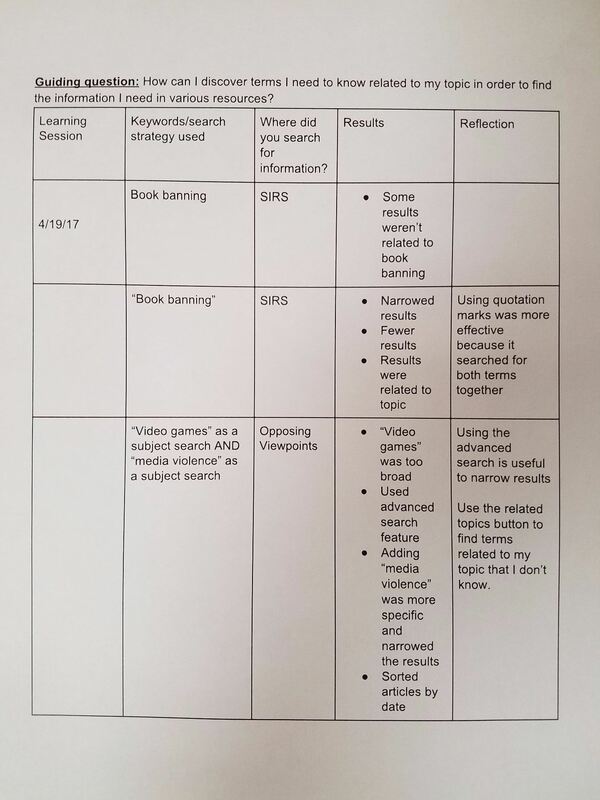 I introduced them to the keyword log and modeled a few sample searches using the topic an at-risk learner chose in order to provide some targeted scaffolding. I added a few columns to the log described in the article just to ensure that students were providing detailed explanations. As intuitive as I thought this log would be, we encountered a few obstacles during implementation. To start, students aren’t used to slowing down! They wanted to rush through the research process. We met some resistance when we told them they would be recording each search they tried. Of course the whole point was for them to discover that the Gather phase should take time in order to discover the best possible sources of information that would help them develop their researched argumentative speech. Below is an excerpt from a reluctant learner’s keyword log. I sat with him as he completed his searches to show him different search strategies. 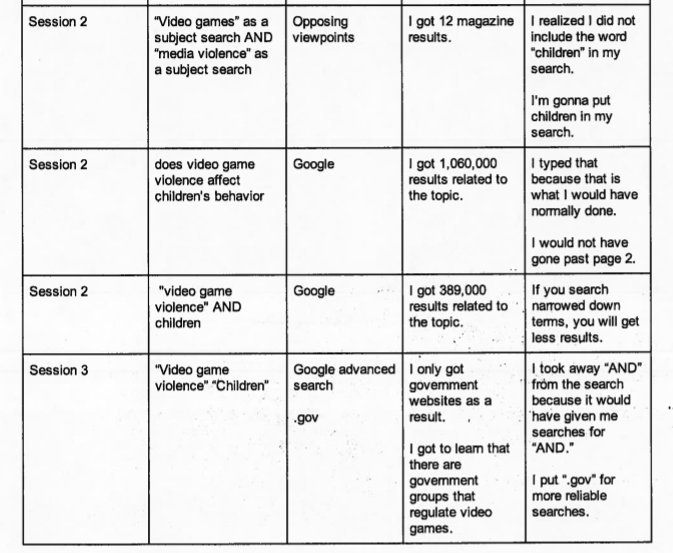 In the first entry, you can see that he realized he wasn’t even searching for one of the main parts of his topic: how do violent video games affect children? His reflection in the second entry shows how I asked him to record his true search behavior, and what we know to be true from research: most searchers do not even scroll down on the first page of results. I also spent a good deal of time telling them to type more in the results and reflection columns. As the research assignment progresses, students will see how useful the log is the more specific and detailed their responses are. We discovered that we can really learn about how students conduct research simply by watching them and asking them to search how they would if they were on their own. Start with where they’re at as learners to gather information about their current skills and how they think about research. Then address misconceptions and a lack of skills as you see them. There is an often overwhelming number of research skills that students can learn: how to search the open web using advanced search strategies and limiters; discovering special interests groups, independent groups, research organizations; picking which database fits their information needs; how to search different databases; how to paraphrase; how to cite. Yikes! But this keyword log provided an organized starting point. My goal is to work with more teachers to use this log at the beginning of their classes and tailor research assignments to target specific research skills instead of trying to teach every skill every time. Most of the students shared in a survey when we were finished that they had never been taught Boolean search strategies and that the keyword log helped them stay organized. They gained a clearer understanding of how databases work. And remember that the GID model works in any discipline. Information literacy skills should be embedded in each and every course if we want our students to truly learn these lifelong skills. The key here is that authentic learning does take time. Using databases isn’t always intuitive, and students need practice after direct instruction. Partner up with your school librarian to build these skills into your research units. It’s an investment that pays off in the end. This article reminded me how important it is to use that keyword and search log. Glad to hear your comment! I have to give all credit to Leslie and Anita for publishing their article in the first place! The keyword log is an effective learning tool, and I hope you’ll share your success using it! Fantastic example of this strategy, Jamie! I’m glad to see how Guided Inquiry helps educators to see the benefit of slowing down in learning. You provide examples with your modeling and great evidence from students about how the log works and is a wonderful and rich formative assessment of true learning through inquiry about searching! Bravo! And I can’t thank you enough for sharing your rich examples with us!